At this time of year, people all over the world are celebrating this festive season with beautiful light displays. This new image of two colliding galaxies is a cosmic contribution to the celebrations that includes X-rays from the Chandra space telescope along with visible and infrared light from other observatories. 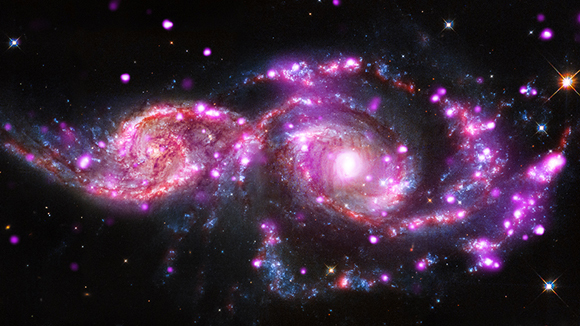 These two galaxies look like their spiral arms have been decorated with strings of pretty pink fairy lights! These galaxies have been captured brushing past each other as they travel through space. The encounter has created one of the most amazing collections of super bright X-ray (http://www.unawe.org/kids/unawe1145/) lights ever seen! Each of the 28 pink blobs in the picture is a special, extremely bright object known as an "ultraluminous X-ray source", which we can shorten to ULX. What exactly these ULXs are is still a mystery, but most scientists agree that they're probably a strange type of star system, with a normal star and a black hole orbiting each other. Some of the black holes may be about 5 or 10 times more massive than our Sun and others may be hundreds or even thousands of times more massive than our Sun! Researchers think that the stars that cause ULXs are very young (at least, in star terms). Whereas our Sun is around 5 billion years old these are probably closer to 10 million years old. This is why most of these ULXs have been found in the spiral arms of the galaxies, where there are lots of stars forming. Cool Fact: These galaxies are sprouting new stars at a rate that is over 10 times faster than our home galaxy, the Milky Way.